Protect yourself from those UV rays with these collapsible canopies. If you haven't relished the feeling of spreading out under a beach umbrella with your own personal (and shaded) view of the waves, this summer is your chance. Beach umbrellas are making a comeback, and there are enough patterns, prints and fringes to satisfy even your wildest '70s design cravings. 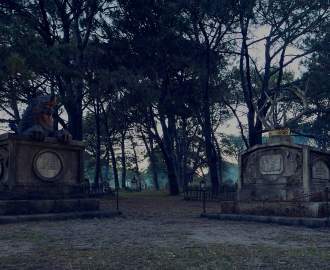 But it's not just flashbacks that have caught our eye. 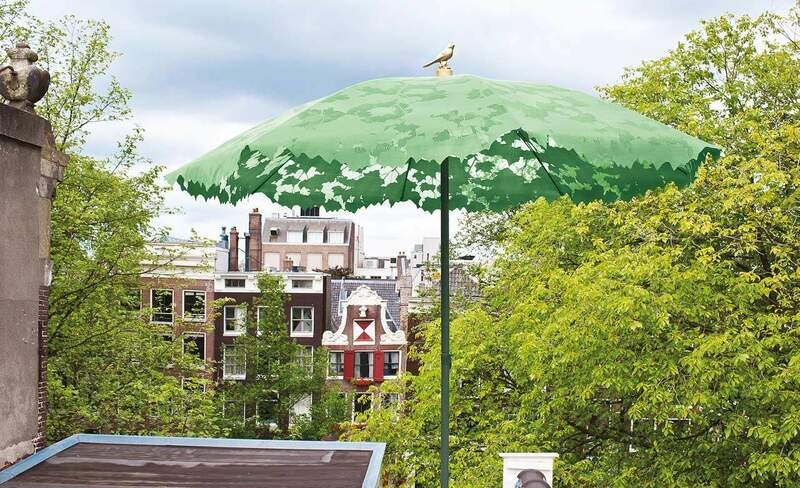 On our hunt for the best current beach umbrellas, we've also uncovered clever bamboo and and biodegradable PVC eco designs, laser-prints to create dappled shade where you sit, understated parasols, and many, many, many eye-catching prints. With so much choice, there's really no excuse to be sporting a sunburn this summer. It was a hard choice between the many bangin' prints this company has on offer (check out their other options for extra inspiration). But this shibori-inspired indigo print won our hearts. And that neon-orange trim? It's too good. Started by surfer and industrial designer Mike Durante and one of his oldest friends, Basil Bangs has made it their mission to reimagine the Australian vintage beach umbrellas they love. That means the latest fabrics, pop art prints, and hard-wearing fixtures. Oh, and and matching, red-wine-proof picnic rugs. We couldn't choose between the lush designs at Sunday Supply Co. Each comes with cotton tassels, lightly varnished beechwood and a sturdy, custom-designed aluminium alloy hinge and hardwares. The premium fabric canopies are UPF30+ and, with a diameter of two metres, will cast shade aplenty. But apart from all that, they look so damn pretty it's hard not to pick up more than one. What? 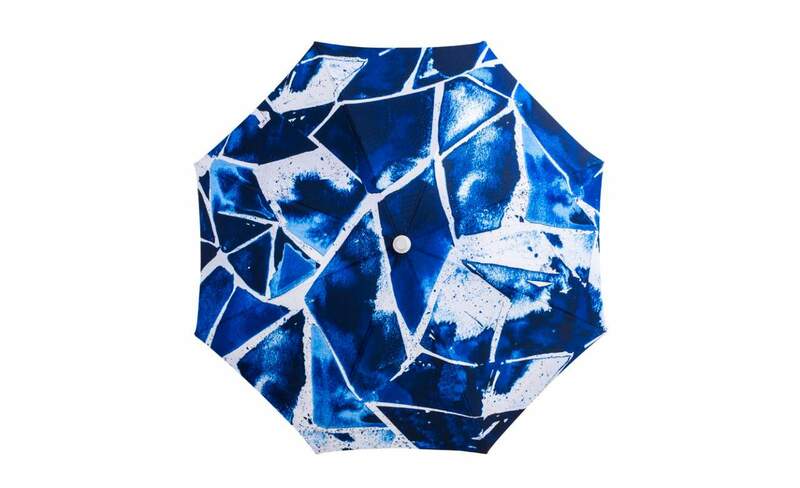 A see-through beach umbrella? Yes, you got that right. Not only does this parasol 99 percent UVA/UVB/UVC resistant, it can also withstand winds of up to 40 kilometres per hour. And if it does start to rain, you're covered — by sustainable and renewable bamboo, organic cotton and biodegradable PVC. If you're into sustainability, you'll likely be impressed to learn that the Brelli breaks down in both aerobic and anaerobic landfill — either just like twigs and leaves, or into biogas. And the energy produced from harvested biogas from one of these umbrellas will recoup more than 90 percent of the energy used to produce it. Handmade in Thailand, and hailing from New York, Brelli ships these luxury, eco-friendly beauties around the world, including Australia. You can also add a non-toxic Brelli marker to your order to create your own design and doodle on your canopy. 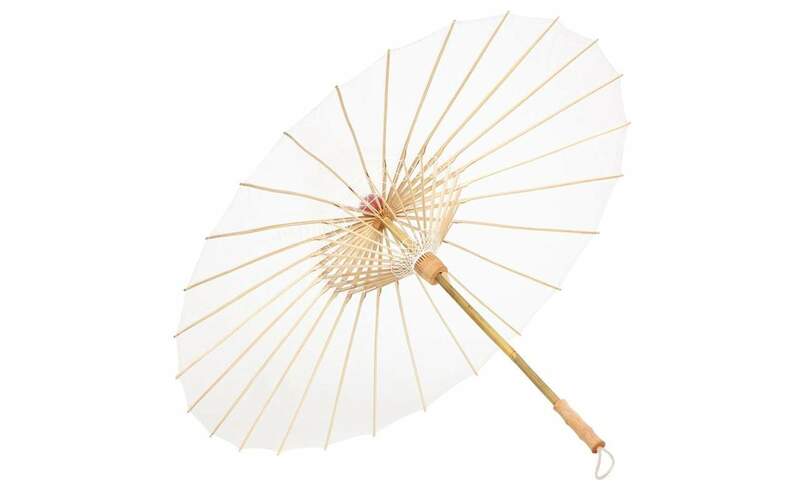 The delicate laser-cut lace pattern of this parasol lets a little sunlight through, creating a dappled shady oasis wherever you take it — just make sure you slip, slop, slap, wrap etc. Sun filtering through the trees and beach times? Two of our favourite things, brought together by this clever design. There's even a little gold bird up top to keep you company. Plus, if you do manage to get your hands on one of these you'll be the proud owner of a piece by Dutch designer Chris Kabel, winner of the DOEN Material prize for his innovative approach to sustainability for his seam chair and bench (check out his Blue Sky Lamp, too). The shadylace parasol even featured in an exhibition as part of Sofia Design Week. 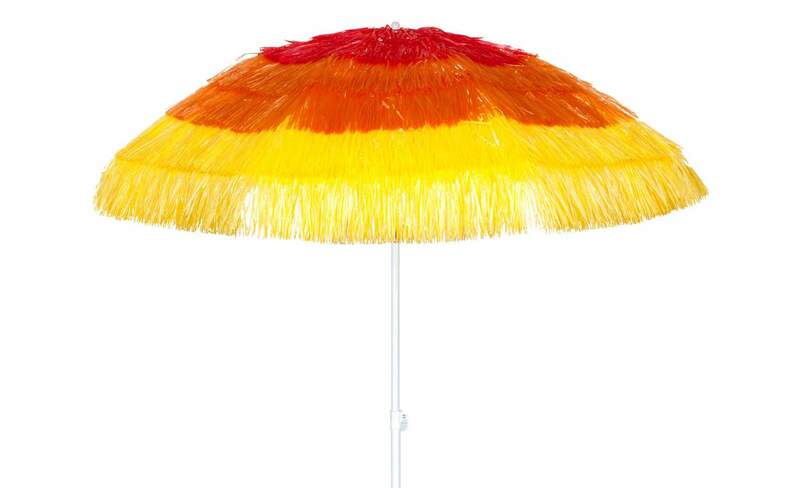 Sure, Sunny Life have umbrellas that aren't completely covered with raffia. 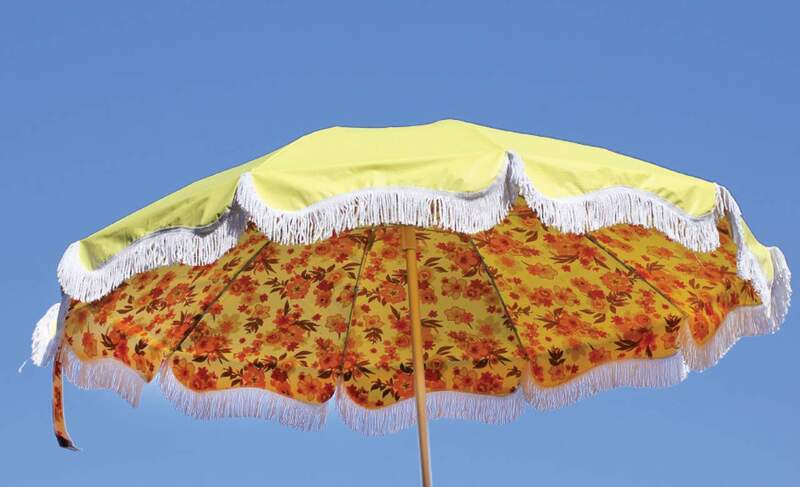 But who could resist this vibrant tropical parasol to shade their summer beach playground? 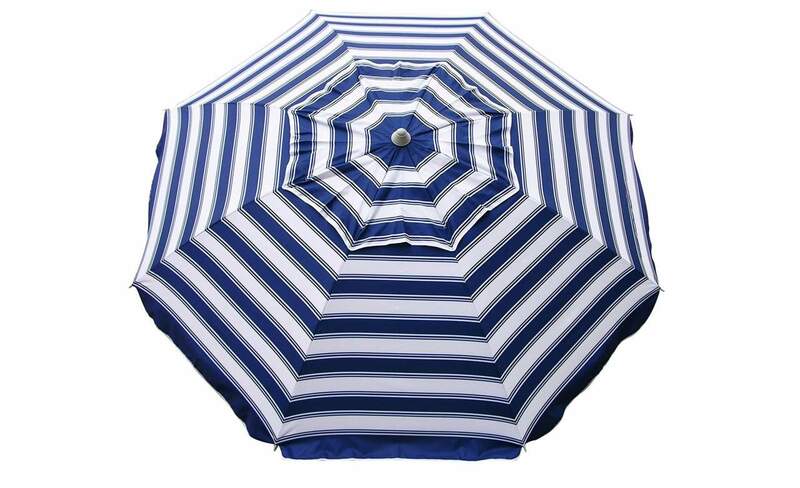 Like so many of the modern beach brollies popping out about the place, it comes with a carry bag and sturdy handle. It is an umbrella, after all. But it's so unique that you're unlikely to see one like it on the beach you're at. This one's for the practical beachgoers. 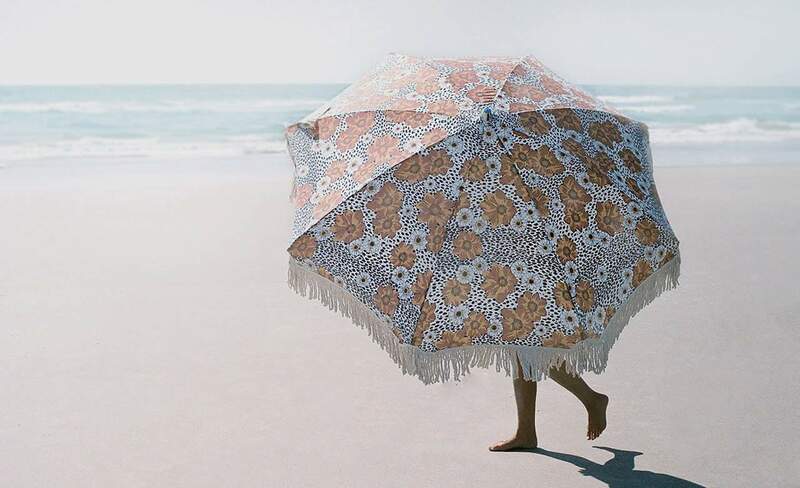 While it doesn't have quite the same look-at-me factor as some of our other feature umbrellas, what it does have is some great design features that will make your beach trip a whole lot more comfortable. Like the air vents on top of this classic blue-and-white striped number. They mean that, if the wind starts blowing, it's got somewhere to escape out the top — rather than tearing the umbrella from your hands. "Hazy, sun-bleached yellow top that shades you with a warm vintage floral. Created while listening to Neil Young's On the Beach and equally inspired by Grandmas curtains." We couldn't put it better ourselves, The Salty Merchants. Every little detail is accounted for on this handmade boutique brolly, right down to the embossed label and clever twist-in mechanism at the base to help you sink your shady shelter into the sand. The Salty Merchants offer a stack of different prints in canvas and vinyl, but looking up at this vintage floral spread while kicking back on a matching retro beach chair seems like a combo that's hard to beat. 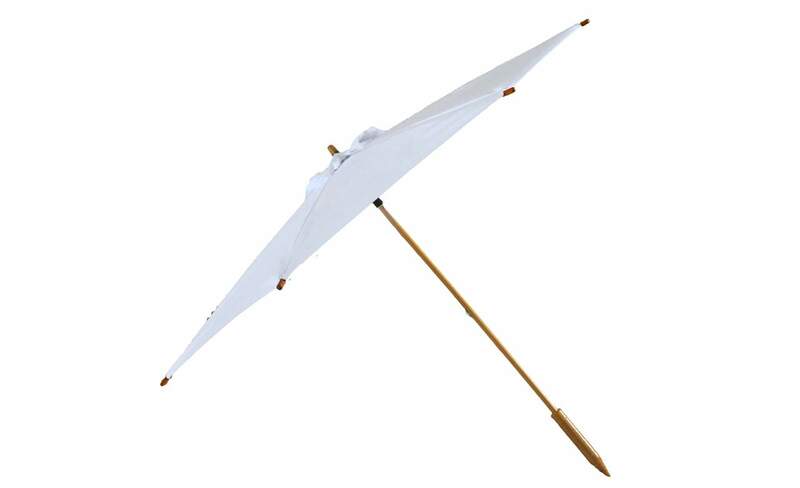 There's something about the simplicity of this umbrella that we really, really like. White like those Greek islands houses we dream about, cotton canopy, wooden sand-spiral handle, and a UPF rating of 50+. What more do you need? Plus, they'll ship you one for free. Need more sun shade than this? How about a whole beach tent? Top image: Sunday Supply Co.